This article was originally published by BrightLeaf Homes as "The Health Benefits of a Certified-Green Custom Home" on May 15, 2018, and is partially reproduced with permission. View the full article. The home is where the heart is, so it's best to make sure your home is healthy. How so? Green construction, or energy-efficient home building, is more than just being environmentally conscious and eco-friendly. The materials, technology and practices used to build green is also healthier for your mind, your body and your family. With better products, such as low-emission materials, a radon mitigation system, sealed combustion appliances, the Indoor airPLUS program and an improved scientific approach to building, certified green homes can have a positive impact on your family's health. Improved heating, ventilation, insulation and air sealing also contribute to reducing risks and symptoms of respiratory disease, asthma, cancer, cardiovascular disease, depression, stress and infectious disease, and more. 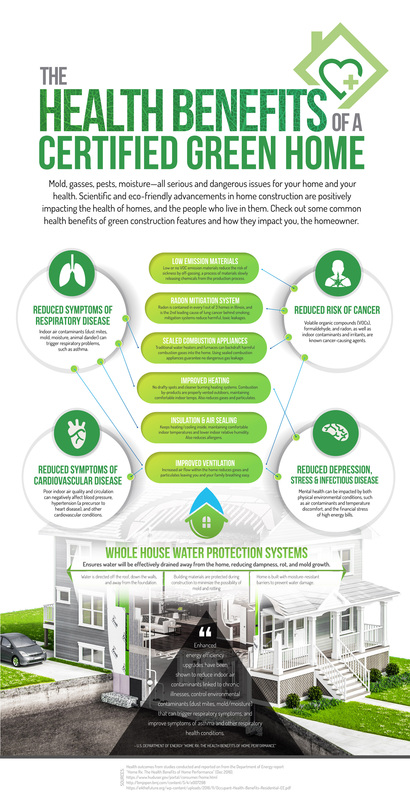 Check out the infographic below to see just how your new build home works to keep you and your family healthy.